Stressful living and lack of sleep take their toll on our body and our mind. Brain Nourisher® contains a special blend of specific Foodform® Essential Fatty Acids (EFA’s) that function as concentrated whole food for your brain cells. 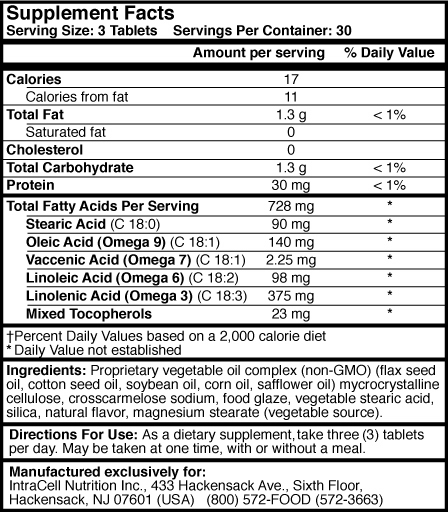 The words Omega 3 and Omega 9 do not refer to specific fatty acids but rather to families of family acids. In each family, such as Omega 3, there are dozens of variations of the way the molecule is formed. These variations are called "isomers." Ordinary EFA products such as fish oil and flax oil contain the various isomers, but mostly the common ones which are mainly for protecting our cardiovascular system. If you are using fish oil or flax oil, you can continue to take it even though you also use Brain Nourisher. Brain Nourisher is produced by taking three vegetable oils and selectively removing some of the more common isomers so the ones we are interested in become more concentrated. Brain Nourisher gives effective support for your brain cells because it is a whole food concentrate from vegetable oils. It does not contain any isolated EFA's. • Brain Nourisher is rich in Omega 3, Omega 6, Omega 7, Omega 9 and other Essential Fatty Acids. • Does Not Have To Be Taken With Meals. Brain Nourisher is so naturally-acceptable to your body you can take it all at once, whenever it is convenient. There’s no upset stomach. • Only 13 Calories Per Serving. You would have to drink gallons of vegetable oils or fish oils to get the concentrations of these specific EFA isomers in 6 capsules of Brain Nourisher. Yet it contains only 13 calories per serving. • Vegetarian and vegan capsules are made from tapioca. They are easy to swallow, or to open and mix the contents with food or drink.